It is rare for a starter motor to fail without giving you some warning, you can spot the signs often weeks before it finally gives up. If you try to start the car, and nothing happens don’t automatically jump to the conclusion that it is the starter motor which is the problem. First check the obvious, is the battery fully charged and are all the connections to the starter motor intact. If these are ok then the problem is either the starter motor itself (unlikely) or the solenoid which controls it (quite common). A common fault that is simple to diagnose with starter motors is a jammed Bendix gear, when you start the car if you hear nothing more than a dull clunk, then chances are that this is your problem. Luckily there is a quick and simple short term fix that will get you home. Firstly turn off the ignition and put the car into 4th gear, then release the hand break and rock the car backwards and forwards, put the hand brake back on, take the car out of gear and try to start the car again. This procedure may have to be repeated a few times to free the jammed gears. As previously stated this is only a temporary fix and the starter Bendix, starter motor or ring gear will have to be replaced to fix the problem. Another problem, although less common, is the starter motor only turning the engine slowly. This problem is caused by a bad earth, and was experienced a friend of mine. At first he thought it was his battery but after charging it fully there was no difference. He then thought that it must be the starter motor, having checked all the connections and everything looked fine and even with a multi meter all the connections read correctly. The car turned over slowly and after a number of attempts still would not start. It was then that he could smell something burning so quickly opened the bonnet to see what the problem was. There was smoke coming from the cable that operates the heater valve. It was then that he realized what the problem was, the earth strap to the engine was not connecting properly even though it was still bolted to the engine and body it was not getting a good electrical connection. The engine was earthing through the heater cable so when checked with the multi meter it gave a reading that the engine was still earthed but of course the heater cable could not carry the same current as the earth strap so was overheating and causing the starter motor to run slow, so slow that the engine could not start. Simply remove and either clean up or replacement of the earth strap will solve this problem. As stated starter motors rarely fair without warning, symptoms such as turning the engine slowly, Bendix jamming and intermittent operation will usually occur before total failure. If you start to experience any of the above symptoms action should be taken as soon as possible to remedy the situation before you get stranded. On most classics removing the starter motor is not a difficult job, there are few electrical connections (always label these anyway) and usually only a couple of bolts to remove. 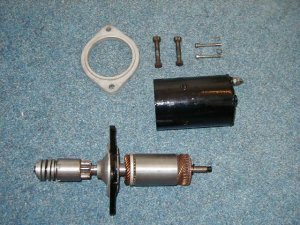 Once removed from the car the starter can be dismantled on a clean work surface. Do not submerge the unit in cleaning fluid as this will distribute copper and carbon dust into the electrical windings causing short circuits and will result in having to purchase a new starter motor. Instead use either compressed air (always wear the appropriate eye protection and dust mask) or a clean lint free cloth dampened in cleaning fluid to clean up any dust inside the casings. The Bendix gear can at this point be inspected for any signs of damage or wear. 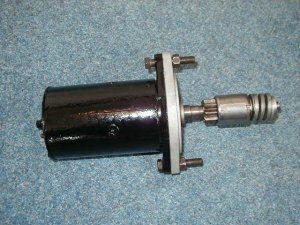 The spring return should also be checked and if this is non-operational the sub assembly can be replaced, if you are not confident doing this yourself then your old unit can be used as an exchange item for a new starter motor. This is much cheaper than buying a new unit outright. The main shaft bushes on the front and rear end plates also need to be checked and renewed if necessary. Check the length of the carbon brushes and compare the length with the workshop manual. If they are outside this recommended length then they should be replaced. Replacing the brushes usually involves soldering, which is not difficult, but if you do not have the equipment or the ability to solder then and auto electrician will be able to change them for you. Alternatively you could get an exchange unit, but this is far more costly than changing the brushes. The electrical windings should be checked for any signs of damage or scorching that would indicate a fault. The commutator assembly should be checked to ensure the contact surface is clean and smooth, if it is dirty it can be cleaned with a cloth dampened in contact cleaner. The commutator can then be carefully polished with very fine emery paper, making sure that the armature and windings are kept clean. 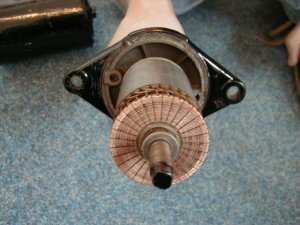 If it commutator is very badly scored then it will need to be turned on a high speed lathe taking only the finest of cuts, as most people do not have access to such equipment purchase of an exchange unit is recommended. 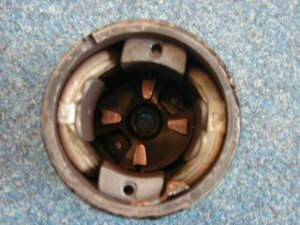 Never undercut the insulation material between the copper segments or damage will occur resulting in the starter motor being scrapped.